Quality of life (QOL) of a patient is usually computed as the (weighted) sum of items and analysed by means of multiple regressions to evaluate its relationships with various measured factors. The aim of the present study was to compare results derived under classical statistical method with those obtained under more appropriate statistical techniques for QOL. Analyses were applied to data from 4155 subjects participated in 2012 in a community based sample study in the French speaking part of Belgium and which completed a web-based questionnaire on their weight-related experience. Confirmatory factor analysis (CFA) and structural equation modeling (SEM) were carried out to derive QOL and to test direct/indirect effects of body mass index (BMI), age, body image discrepancy (BID), latent socio-economic (SOCIO) and latent subjective-norm (SN). No major differences were found under both SEM and the product of coefficients approach using SAS PROCESS macro developed by Hayes. 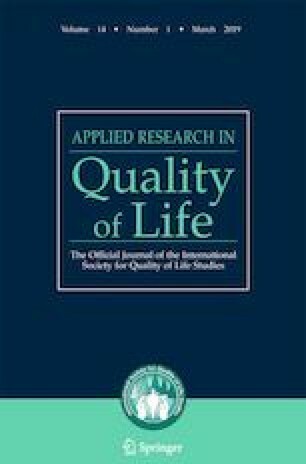 Significant direct and indirect effects on physical and psychological dimensions of QOL were found for age, BMI and SOCIO while significant direct effects were found for BID and SN (p < 0.0001). Factor loadings were found to be significantly different according to gender (p < 0.0001). BID and SN are partially mediators on the relationships between BMI and QOL. The study also confirms the role of SOCIO on the (un)observable variables included in the model. However, the large sample size provided significant tests with small effect size and couldn’t highlight pertinent differences between both methods. This work was supported by the European Regional Development Fund and the Belgian public health authorities (Program INTERREG IV – 50WLL/3/3/136). As collected data were anonymous, no written informed consent was required by the ethics committee of the University hospital of Liège, patient consent was assumed based on their voluntary participation. Annette Alstadsæter, E. A., Alstadsæter, A., & Feiring, E. (2014). Does healthcare moderate the impact of socioeconomic status on Selfrated Health? Journal of Clinical Research & Bioethics, 05(01). https://doi.org/10.4172/2155-9627.1000169. Hayes, A. F. (1986). PROCESS: A Versatile Computational Tool for Observed Variable Mediation, Moderation, and Conditional Process Modeling 1. http://www.afhayes.com/. Accessed 23 March 2018. Marmot, M. (2013). Report on social determinants of health and the health divide in the WHO European region. World Health Organization., 234. http://www.euro.who.int/__data/assets/pdf_file/0004/251878/Review-of-social-determinants-and-the-health-divide-in-the-WHO-European-Region-FINAL-REPORT.pdf. Accessed 14 Nov 2017. Rosseel, Y. (2014). Structural equation modeling with lavaan. Using R for personality research, 1–127. https://personality-project.org/r/tutorials/summerschool.14/rosseel_sem_intro.pdf. Accessed 14 Nov 2017. Rosseel, Y. (2017). The lavaan tutorial. http://lavaan.ugent.be/tutorial/tutorial.pdf. Accessed 15 Nov 2017. Stevens, J. (2009). Applied multivariate statistics for the social sciences. In J. P. Stevens (Ed. ), Version details - Trove (5th ed.). New York : Routledge, c2009. http://trove.nla.gov.au/work/17113022?q&sort=holdings+desc&_=1510743660016&versionId=44804159+218188866. Accessed 15 Nov 2017. Yang Hansen, K., & Munck, I. (2012). Exploring the measurement profiles of socioeconomic background indicators and their differences in reading achievement: A two-level latent class analysis. IERI Monograph Series, 5. http://www.ierinstitute.org/fileadmin/Documents/IERI_Monograph/IERI_Monograph_Volume_05_Chapter_3.pdf. Accessed 27 Feb 2018.